Gulab jamuns are spongy balls,a quite famous North Indian sweets prepared usually with khoya and maida ,later they are fried in oil and soaked in sugar syrup. Usually we South Indians prepare this spongy juicy jamuns with store bought jamun mix, which makes the life easier. But after becoming a food blogger, i crossed many easy breezy preparation of this jamun with household ingredients especially with milk powder or else with homemade khoya. For our this month's South VS North India challenge, an event by Divya, two of our group members challenged with two beautiful dishes. For Southern India team, Pallavi Purani of Cook Eat Burrrp shared gulab jamun for this month's challenge while Yasodha of Yasodha's Kitchen challenged Northern India team with Adhirasam. As am a part of Southern team, i have to prepare gulab jamun. When i received the challenge mail,immediately i went through the mail and i found that Pallavi shared an another interesting version of gulab jamun with milkpowder. Since i had all the ingredients in my hand, i prepared immediately this morning and served these super spongy jamuns to everyone after their lunch as dessert. Thanks Pallavi, this gulab jamun recipe is definitely a keeper and my jamuns turned out utlimately super spongy,prefect and absolutely delicious.Since i rolled my jamuns as tiny balls, they gets soaked quickly when compared to the medium sized balls, i got almost 40numbers of jamuns with the measurements Pallavi have given. Sieve together the milkpowder,maida,rava and baking powder in a bowl. Gradually add the cream and melted ghee and knead everything smoothly to form a dough. Keep aside the dough covered with a towel for half an hour. Meanwhile heat the water and sugar together in medium flame,boil it until the sugar gets dissolves and put off the stove. Keep aside and let it cool. Now make small balls from the prepared dough, roll it well and these balls should have any cracks. Heat the oil or ghee for deepfrying in medium flame. Drop gently the rolled balls and fry in medium low flame until they turns golden brown, strain the excess of oil with a paper towel. Add these fried balls to the already prepared sugar syrup and let them sit for an hour. Serve gulab jamuns topped with chopped pistachios and dessicated coconut flakes. Wow Priya!! That was super fast!! Looks awesome and super inviting!! Awesome priya!!! Super fast...Looks absolutely delicious...Lovely inviting click!! priya , looking great. so fast to post for the challenge. Oh my goodness! You got me salivating dearie...ooo lala! Absolutely delicious ,Thnk god, I've some left over gulab jamun to stisfy my cravings.. Deewali sweets seiya arambichacha? Truly tempting jamuns..And I loved your cute bowls Priya. wow.. they are so cute and tempting..
Looks awesome and super inviting!! Spongy and delicious...love to eat one jamun. Beautifully presented, and it looks stunning. Delicious!!! Delicious Priya!!! Super fast !!! Great!!!! Very inviting n nice presentation!!! Very tempting and delicious sweet !! 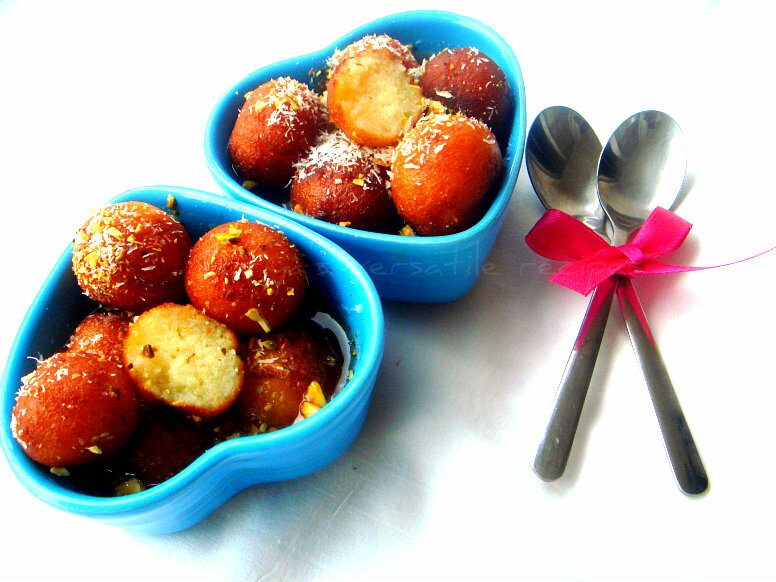 Delicious gulab jamuns, Love the idea of using milk powder. Perfect Gulab jamoons.With Diwali around the corner I have been going through your wonderful blog to decide what goodies to whip up for diwali. THE PIC IS SOO TEMPTING...!!! Very tempting gulab jamuns! So delicious! The Jamuns look lovely. The texture is perfect and I am sure it tasted great! Can you please let me know what brand of milk powder you used? Priyakumar, mine is a french product called Regilait, any best quality will works out wonder. Mouth watering here, they look perfect! Very inviting and absolutely divine gulabjamun. Absolutely delicious!!! so soft, sppongy and yummy! !